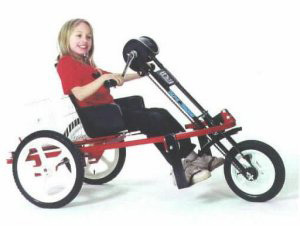 The Palmer "Kids Handcycle" is a unique recreational device designed for the physically challenged child. The easy entry/exit frame and adjustable fore and aft bucket seat with arm rest makes biking along with family possible. This three wheel mobility aid features a low center of gravity for stability, choice of hand pedal opposed or in-line cranking, coaster brake, foot bar with toe and heel strap, rear basket, seat belt, front fender and sporty mag wheels. Options include vertical Hand grips.